Marcel Fernández Peréz (1884-1929) was born in Madrid and began his career as a circus clown in Paris. After appearing in a few French comedy films he signed up with Ambrosio Films, an Italian production company, starring in and directing several films. For these films he was known as Robinet but he had many other aliases including Marcel Fabre, Michel Fabre, Fernandea Perez, Tweedy, Tweedledum, and Twede-Dan. Ten of his films, five made in Italy and five in America, were released on DVD in 2015 as The Marcel Perez Collection. 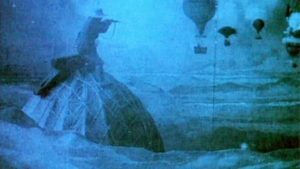 In 1913, while still working for Ambrosio Films and according to some sources, Perez released a series of 18 films in serial form based on the 1879 novel The Extraordinary Voyages of Saturnino Farandola, in the Five or Six Parts of the World and in All Countries Known and Unknown to Mr. Jules Verne. Other sources indicate that the work originally appeared as four featurettes. It tells the story of Saturnino Farandola, who as an infant was the only survivor of a shipwreck and drifted to an island where he was raised by monkeys. Eventually he is rescued and has a series of outlandish adventures around the world which include escapades under the ocean and an aerial battle involving hot air balloons. The imaginative way in which these scenes are rendered certainly owes much to the films of Georges Méliès, who made his final film the year previous. Lobster Films restored the surviving material for a 1997 DVD release, editing it into a single 100 minute feature though I’ve read that one of the sections was abridged. As far as I can tell the DVD is no longer available but has been uploaded to YouTube and includes the excellent score. There’s no English translation of the Italian intertitles but the film is still enjoyable even if you don’t always understand what’s going on.